Good morning, Poets! It is another fine day for us to share poetry. Either a poem you have written specifically for Poets United or a poem that you wrote for another site and want to receive a wider audience. If you haven't already seen Rosemary's Thought Provoker - Self Portrait in D Minor, please scroll back. What a talented woman she featured! It is very inspirational to read how the poet learned to tell her story despite some obstacles in her early life. Check back Monday for Sherry's feature of poetry by three amazing women! Next week Sumana's prompt will be Vision - a theme one can look at in many different ways. Now let's share poetry. Link your poem below. Stop in and say hello. Visit the poems of others who post. Be sure to come back a few times to see the new poetry that has been posted. See you on the trail. Lovely to see your beautiful Spring photo, Mary – as here I dread the coming cold. I am busy proof-reading my friend Helen Patrice's new volume of short stories, as well as participating in NaPoWriMo (at "toads") so please excuse me everyone, if I am a little late getting to some of your poems. Good Sunday Morning all! Still cold with snow here but it appears this week we may finally be turning to spring....I can't wait as I need to get out in my garden finally. Hoping all are well and I am so looking forward to some poetry reading bliss today....see you all at some point today in the blogosphere. Another poetic Sunday and the eighth day of NaPoWriMo! It's damp here but there are buds on the willow and the shrubs, daffodils and tulips are starting to open, and a deer visited the garden this morning! It is four in the morning, so for once i am not late to the party, lol. I am doing NaPiWriMo too, always a good challenge to keep the pen moving. Happy Sunday, poets! Thanks, Mary, for hosting. Good morning, Friends! Nice to see you in the Pantry today. Goodday, poets! I brought a sort of sonnet today, about a meeting i went to yesterday. Remember, You won't be able to comment on my poems this month unless you email me or visit facebook--sorry--but it is an interesting exercise "to write in the dark." I'm out at Quaker things all day, but I'll be back this evening to feast on your poems. Something to look forward to. It's a beautiful Sunday here in Southern New Mexico. Hope it is for you too. A Happy Sunday from me too! Happy Sunday! 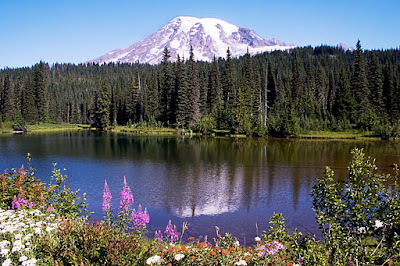 Love Mount Rainier. We visited and explored on a trip to Seattle. Mount Rainier looks stunning. Quite late in the evening here so I shall look forward to reading tomorrow.